The most long produced truck in Czechoslovakia was the model Praga V3S (Vojenská 3tunová Speciální - Military 3-ton Special). 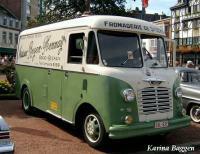 This was a military truck (and later civilian) and produced from 1953 virtually unchanged. It was made by the "Prague Hostivar" company in Prague-Vysocany, later in Prague-Letnany and Bratislava. In 1996, the production of these trucks was moved to the Avia plant, where it was produced only for 2 years under the name P-V3S M6. The only difference of Avia made trucks from the original Praga models was the front bumper with integrated rectangular headlights.